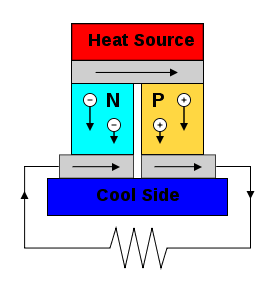 Researchers at the UPNA/NUP-Public University of Navarre have produced a prototype of a self-cooling thermoelectric device that achieves “free” cooling of over 30ºC in devices that give off heat. It is a piece of equipment that acts as a traditional cooler but which consumes no electricity because it obtains the energy it needs to function from the very heat that has to be dissipated. Thermoelectric generation has been widely used for mid and high temperatures (from 250ºC to 1,200º C) in military and aerospace uses. The thermoelectric generator that powers the rover Curiosity on Mars is a prime example because of its topicality. The GETER project of the Public University of Navarre aims to adapt this technology to low temperatures and to optimize its application for civilian purposes.